Here we describe how to setup OpenNMS with SMSEagle for SMS notifications. Create a new user for this script in OpenNMS. 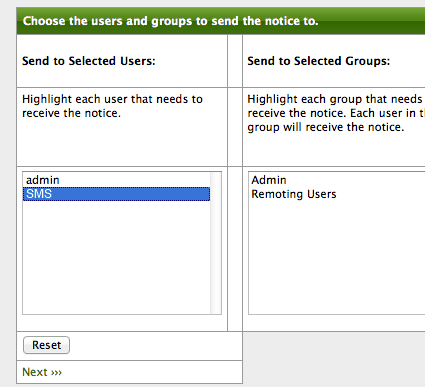 Click the Admin link in the menu bar, go to Configure Users, Groups and On-Call Roles, and then click Configure Users. Then, click the Add New User link, and enter a username and password in the form, then click OK. Next, fill out the relevant user information. Finally, click Finish down at the bottom of the form. To receive a notification, your user or a group that your user is in needs to be a part of a destination path. A destination path helps OpenNMS determine who is eligible to receive a particular notification, depending on user name, groups, duty schedules, and other rules. Go to the Admin page, click Configure Notifications in the Operations section, then Configure Destination Paths, then click the New Path button. Give it a name, like SMS, then click Edit. Add your new user by selecting it, then click Next >>>. On the next page, leave the defaults (javaEmail and on) and click Next >>> again. Finally, click Finish and you should see your new tutorial path in the Existing Paths section. Go to the Admin page, click Configure Notifications in the Operations section, then Configure Event Notifications. In here you ‘ll see a list of events which are configured for notifications, some of which are turned off. You can create a new event notification by clicking the Add New Event Notification> button near the top. Click the Add New Event Notification button at the top of the Event Notifications page. 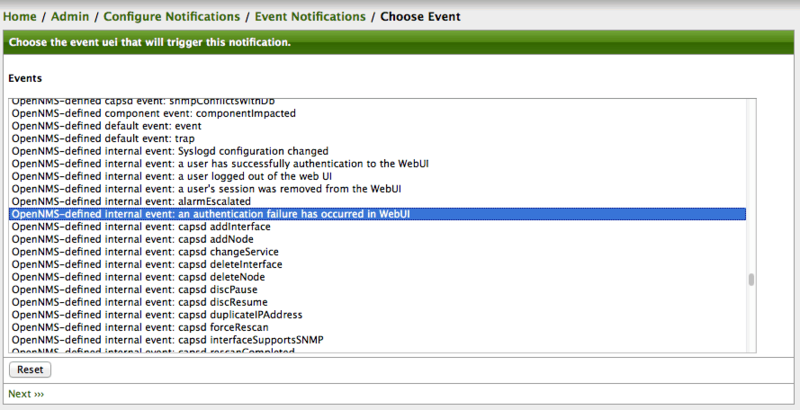 From Events choose OpenNMS-defined internal event: an authentication failure has occurred in WebUI. On the next page, you can build a rule for matching a set of IP addresses and/or services. In this case, we’re just matching an internal OpenNMS event, so we’ll continue on and click Skip results validation >>>. You should now see your notification event in the list, but it will be disabled. Set the radio button to On to enable it, and you should be ready to send a notification. Also, if your mail server requires authentication for sending, see the section under “These properties define the Mail authentication.” and edit them as appropriate for your environment. By default, OpenNMS ships with notifications disabled, so you don’t get them accidentally as you’re just setting things up. The last thing you need to do once you have things configured as you like is to enable notifications. In the main OpenNMS Admin page, there is a radio selector labeled, Notification Status. Change it to On and click update.